Go6976 abolished the anticalcification activity of CST by promoting the ossification of cultured VSMCs. Rat VSMCs werecultured in growth medium or calcification medium in the presence or absence of 10 7mol/L of CST or in calcification medium containing10 7mol/L of CST and pretreated with different doses of Go6976 (0.01, 0.1 and 0.5lmol/L) for 30 min. On day 7 (A, n=4) and 12 (B,n=4), VSMCs were harvested for the determination of ALP activity (A) using an ALP assay kit and calcium content (B) using the OCPCmethod. The VSMCs cultured with calcification medium containing 10 7mol/L of CST were pretreated with different doses of Go6976 (0.01and 0.1lmol/L) for 30 min. On day 6, VSMCs were harvested for the detection of expression of OCN (C, D, n=6). Data from at least threeindependent experiments are presented as the mean SEM, and representative images are shown. *P<.05 and †P<.01. Ctrl, control groupin vitro;b-GP,b-glycerophosphate group;b-GP+CST,b-glycerophosphate plus 10 7mol/L cortistatin group;b-GP+CST+Go6976,b-glycerophosphate plus 10 7mol/L cortistatin plus Go6976 group. Acta Physiol, 2018, 223(3):e13055. Go6976 purchased from Selleck. 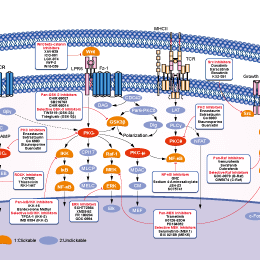 Erk5 activation depends on Mek5, classical PKC and Mek1/2. MOVAS cells were serum-starved overnight and then treated for 1 h if not indicated otherwise with inhibitors targeting Jnk (SP600125, 10 μM), p38 (SB203580, 10 μM), Mek1/2 (CI-1040, 3 μM), Jak2 (AG490, 10 μM), Src (SU6656, 0.5 μM), Go6983 (PKC, 1 μM), Gö6976 (classical PKC, 1 μM), proteasomes (MG132, 25 μM), TPA (100 ng/ml for 15 min to activate PKCs or overnight to inhibit) and Mek5 (BIX02189, 1 μM), as well as Ca2 + chelators (EDTA, 2 mM; BAPTA-AM, 10 μM; both with 30 min preincubation), followed by stimulation with 20 ng/ml PDGF-BB for 10 min. Total cell lysates (TCL) were prepared and subjected to SDS-PAGE. Erk5 and PDGFRβ activities were measured by band shift and Tyr857 phosphorylation, respectively, using immunoblotting. Panel E and G show representative immunoblots. Cell Signal, 2016, 28(9):1422-31.. Go6976 purchased from Selleck. Representative micrographs showing immunostaining results for p-PKCα and laminin, LC3 and laminin, SQSTM1/p62 and laminin, LAMP2 and laminin in the kidneys at day 7 after UUO. Slides were counterstained with DAPI to visualize cell nuclei. J Biol Chem, 2018, doi:10.1074/jbc.RA118.002191. Go6976 purchased from Selleck. 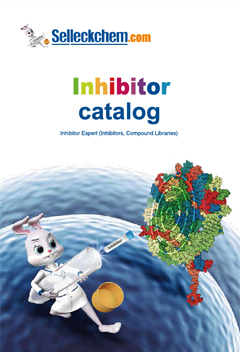 Inhibition of InlB-mediated entry by a chemical inhibitor of PKC-α. HeLa cells were treated with the indicated concentrations of the compound Go6976 699 or with the vehicle DMSO for 45 min before assessment of bacterial entry or cell viability. (i). The effect of Go6976 treatment on entry of Listeria expressing InlB is shown. Data are means +/- SEM from three experiments. *, P < 0.05 compared to the DMSO only (-) condition. (ii). Go6976 treatment did not affect viability of HeLa cells as measured with MTT assays. Results are mean +/- SEM values from three experiments. (iii). Go6976 treatment did not reduce entry of E. coli strain HB101 expressing the invasin protein of Yersinia enterocolitica (inv+ HB101). Data are mean +/- SEM values from three experiments. Infect Immun, 2017, e00087-17. Go6976 purchased from Selleck. Upper: representative immunoblots of the total lysates of cultured astrocytes after SHH or BSA with or without Go6976 for 6h. Lower: statistics, n = 4 in each condition. Neuroscience, 2017, 365:217-225. Go6976 purchased from Selleck. In brief, for measuring PKCα, and PKCβ1 and PKC from rat brain, the assay mixture of 200 μl contains 50 mM HEPES (pH7.5), 5 mM MgCl2, 1 mM EDTA, 1.25 mM EGTA, 1.32 mM CaC12, 1 mM dithiothreitol, 1 μg of phosphatidylserine, 0.2 μg of diolein, 40 μg of histone Hi, 10 μM [γ-32P]ATP (1 μCi/ml), and 5-10 units (pmol of Pi/min) of PKC. Assays are started by the addition of [γ-32P]ATP, incubated for 5 min at 30 °C, stopped by the addition of 2 ml of 8.5% H3PO4, filtered through 0.45-μm nitrocellulose filters, and evaluated by scintillation counting. Cells are suspended at 2 × 105 per point in 200 μl RPMI/10% FCS. The inhibitor under investigation is added at the appropriate concentration and the cells incubated for 48 h at 37°C, 5% CO2. MTS activity is measured by CellTiter kit according to the manufacturers instructions. Results are expressed as a percentage of control (cells without inhibitor). Martiny-Baron G, er al. J Biol Chem. 1993, 268(13), 9194-9197. Grandage VL, et al. Br J Haematol. 2006, 135(3), 303-316. Qatsha KA, et al. Proc Natl Acad Sci U S A. 1993, 90(10), 4674-4678. Duan GJ, et al. Inflamm Res. 2011, 60(4), 357-366.